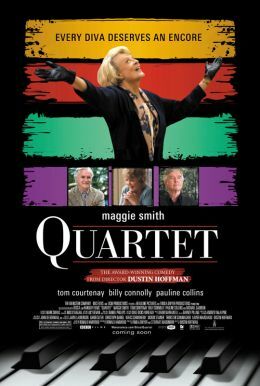 The directorial debut of Dustin Hoffman, QUARTET is a comedy starring Maggie Smith (HARRY POTTER franchise, GNOMEO AND JULIET), Billy Connolly (GULLIVER'S TRAVELS, THE LAST SAMURAI), Michael Gambon (HARRY POTTER franchise, THE KING'S SPEECH) and Pauline Collins (ALBERT NOBBS, FROM TIME TO TIME). QUARTET tells the story of Reggie (Courtenay), Wilf (Connolly) and Cissy (Collins) who reside in Beecham House, a home for retired opera singers. Each year they stage a concert to celebrate Verdi's birthday, which also raises funds for the home. Reggie's ex-wife Jean (Smith) arrives at the home and creates tension, playing the diva part but refusing to sing in the concert. QUARTET was written by Sir Ronald Harwood.